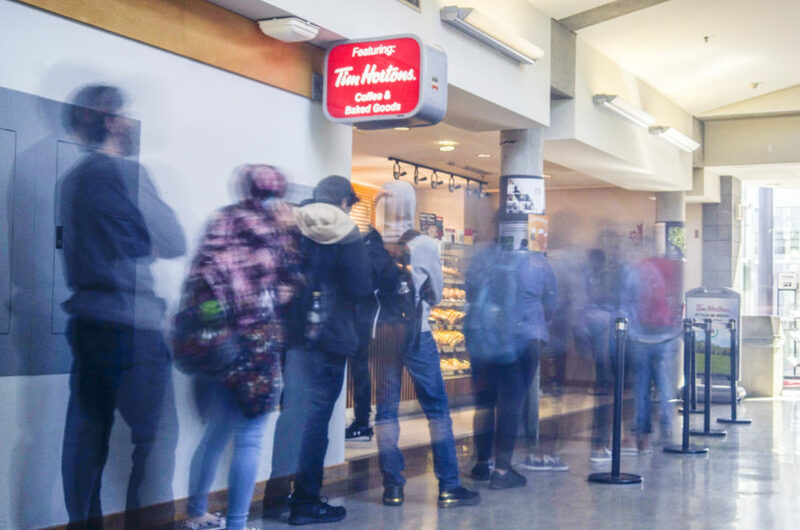 Everyone who has been to the Cedar building knows that the Tim Hortons on KPU’s Surrey campus is easily the most popular destination for students looking to grab a quick coffee or snack in between classes. Most items on the Tim’s menu cost less than similar ones at the Grassroots or the cafeteria, and its location makes it a safer bet than off-campus options when you’re pressed for time, even considering its constant line up. These are all compelling reasons for students to be patrons of the coffee chain, but they should know that there’s more to this story. Over the past decade, Tim Hortons Incorporated has done a lot of things I find disagreeable. In 2013, franchisee owners in Fernie were allegedly taking overtime pay back from temporary foreign workers, sometimes driving them to the bank to deposit their paycheques and demanding overtime pay back in cash. The complainants and the franchisees eventually settled, and Tim Hortons decided to expand its auditing practices for the treatment of employees who are foreign nationals. Shortly afterward, the government implemented restrictions on restaurant chains’ ability to hire temporary foreign workers. Tim Hortons’ CEO, Marc Caira, responded by saying that the quality of products and service was likely to suffer as a result of the restrictions. This is because the chain franchisees relied on temporary foreign workers as a way to avoid improving wages or benefits in order to attract more workers from local communities. To wit, Tim Hortons’ actual position was that the government should let them hire more workers from outside the country—who they could get away with paying lower wages to—or they would just start offering worse service. For a brand with an image based on being “proudly Canadian,” that’s not a good look. People have been complaining for years about the decline in quality of Tims food and coffee, but most people don’t know that there’s a systemic reason behind it. To cut costs, they’ve been reheating frozen doughnuts since the early 2000s, and about 50 per cent of their company growth over the last 10 years has come from building new locations, expanding into malls, airports, universities, and even military bases. In 2014, the same year that Caira complained about Tim’s being understaffed, the company announced its intention to open 500 new stores in Canada and 300 in the U.S. Since then, the company merged with Burger King to form the imaginatively named Restaurant Brands International, and has been focusing on building new outlets outside of North America, including 1,500 in China over the next 10 years. It’s becoming more evident that their business model relies on prioritizing quantity over quality, even if it negatively affects their customers and employees. In response to a $2.40 minimum wage increase last year, Tim Hortons franchisees in Ontario started cutting employee benefits, getting rid of paid breaks, and even requiring their employees to buy their own uniforms. Another location has even forbid employees from accepting tips, telling them to put them in the till instead. Restaurant Brands International denounced these franchise owners in the press, calling them “rogue groups,” but it’s unclear if they’ve done anything else to address these issues. To their credit, earlier this year, they invested $700 million in revamping the brand and are trying to repair Tim Hortons’ public image by addressing what CEO Daniel Schwartz calls “the narrative in the media,” but they’re going to have to do a lot of work before I’ll consider buying anything from them again.